Called “a provocateur in the best sense of the term: a player (and writer) who thrives on pushing buttons,” by Derek Taylor of All About Jazz, and “at the forefront of the fiery reedists today,” by Gregory Applegate Edwards at Gapplegate Music Review, Chris Kelsey’s music embraces the qualities of individualism and innovation that have always defined the best jazz. His work defies easy description. Kelsey first made his reputation with a series of albums for the C.I.M.P. imprint in the ‘90s and ‘00s, as well as several for his own Saxofonis Music and Tzazz Krytyk labels. From the early ‘90s, he maintained an active presence on the Downtown NYC music scene, performing at many of the city’s most important venues, including frequent appearances at the Knitting Factory. 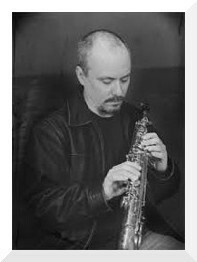 He began a parallel career as a music journalist, contributing to such publications as Jazziz, JazzTimes, The All Music Guide to Jazz, and others, as well as serving as an Associate Editor for the website Jazz.com under the author/pianist Ted Gioia. Kelsey began playing alto sax at the age of ten in his home state of Oklahoma. After graduating with a Bachelors of Music Education from the University of Central Oklahoma, Kelsey moved to New York City, where he became involved with the vital Downtown jazz and new music scene. In 1993 he produced Stomp Own It, by his Almost Jazz Trio, for his own Saxofonis Music label. A series of CDs on the CIMP label followed, featuring such NYC experimental jazz musicians as Steve Swell, Dominic Duval, Jay Rosen, and Francois Grillot. In addition to the Knitting Factory, Kelsey has played many other New York venues for jazz and new music, including Roulette Intermedia, P.S. 122, and the legendary CB’s 313. He’s also performed at many of the city’s summer festivals, including the Knit’s “What is Jazz? Festival; also the Bell Atlantic, Heineken, and Texaco New York Jazz Festivals. Kelsey’s latest album latest is The Electric Miles Project, a self-produced labor of love by his band What I Say, featuring original interpretations of music from Miles Davis’s mid-1970s period. Kelsey recently published a book of his original compositions, entitled Attack of the Contrafact. He is currently the director of instrumental music at Trinity-Pawling School, and lives in Dutchess County, NY with his wife Lisa and their two children, son Jasper and daughter Meret.